Yuppies. Love em or Hate em, good food trails them like Indifference does an Australian Election Campaign. And It would seem we've got the reinvented happeningness of the Newtown property market to thank for a new breed of establishment thats starting to pop up. Prices and Bellies have been a-boomin' ever since. Don't get your tie dye knickers in a knot, now - that's assuming you're even wearing any, you Bloody Hippies. Newtown's always been great for cheap, cheerful and exotic food - but rather than just being a hot spot for Pixie Punks and Philosophy students en route for a macchiato and a quick glance at Hegel before ceremonially offing themselves to Manson, Newtown is slowly becoming a teeny bit more...can it even be said?... Mainstream. Oh, mainstream, can you Imagine! Horror of Horrors. But why perish the thought, my friends, when you can simply devour it? Sabbaba is all set to open up, there's a Max Brennar and a new breed of cafes that are more mumsy than grungy. Older (non vegan shoe wearing) crowds are starting to trek out here, in their motorcars and their walkers, to mosh it out with the cool kids and have some phenomenal food to boot. 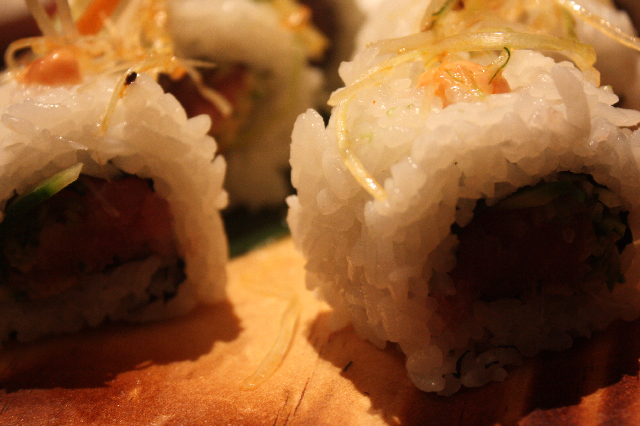 One of the sharper and cleaner options out there is the bustling Japanese sake and dining spot: Iiza. For Goodness Saaa-ke! Delicious discovery. This place is as sweet as it is wonderful, as clean as it is curious. Cosy, friendly and humble. It's one of the few spots in Newtown I can actually take my hygiene fussy Lebanese mother and my Dad, who hails from the school of Cranky Old Arab and doesn't like dim, filthy places where people are being too loud ie. genuinely having a good time. Iiza is also versatile enough to be equally delightful for a giggling gaggle of Helas and Shirleys after a day of hell in the law library. In the tradition of izakaya - Japanese sake places that serve phantasmagorical edibles - it's equal part sushi, equal part hot steaming soupy offerings with precious dumplings and magical miso. 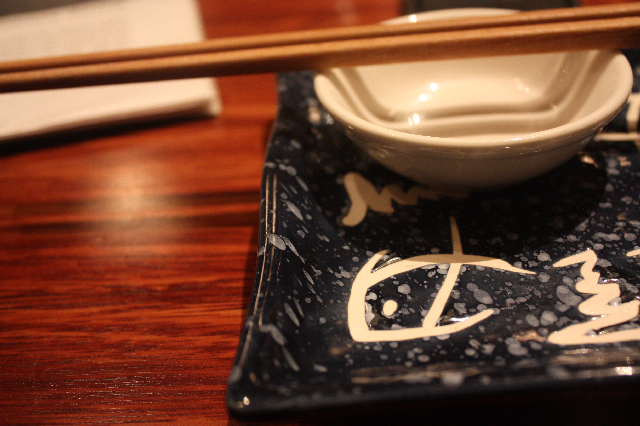 Twirling trajectories of Japanese tapas - which we'll call Japas - and perfect little pots of something sweet. The seafood is especially stellar, so if you're really ready to get your Zoidberg on, just say... Hai! Miso in a Japanese place is like Hot Chips in a Burger joint, if the starter isn't amazing, then don't expect too much for the main affair. Amazingly hot, brothy miso with gentle slivers of salubrious shallot comes ladled to me in a heavy, precious bowl. It's perfect, deep and rich but stopping just shy of too yeasty. The heat is positively wonderful. 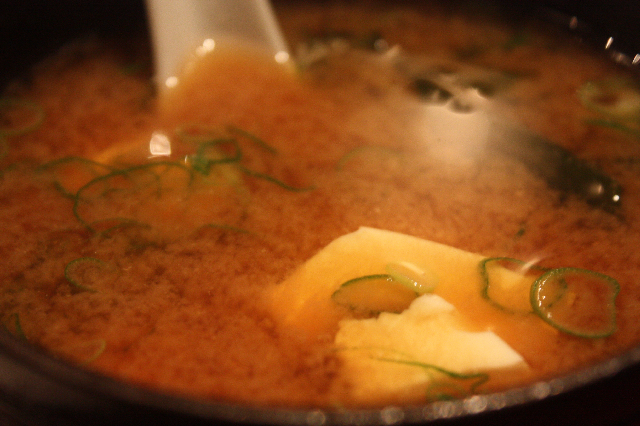 When you boil miso it kills the enzymes, most places take this as licence to serve a dull, lukewarm bowl swamp. Not iiza, the miso is searing in salty and so delightfully hot that I fall into a gentle, quiet rhythm of sips and sighs. So grounding and gorgeous. It's like sinking into a hot, salty bath, without ever getting wet. 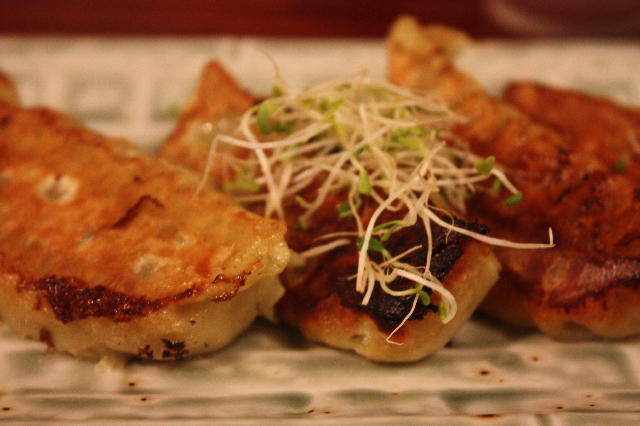 Vegetarian gyoza set all the way to the stunning! Curious and deliciously burnt in some spots, gorgeous little enclaves of perfectly sharp filling spilling out upon the bite, releasing gushes of steam and ginger and maddeningly minced vegetable. 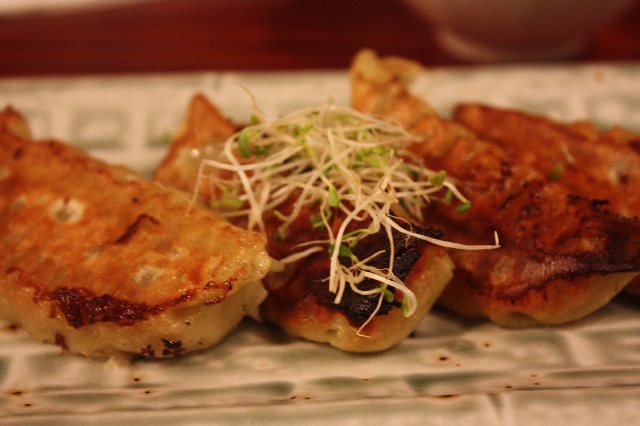 Douse each chubby gyoza baby a little in dipping sauce - spicy and sour - and it's like momentary Japanese Yum Cha. So warm, sometimes soft and sometimes crispy shell, defying the crunchy, minced insides. They're a beautiful medium between a little of the fried oiliness with enough zing to cut the heaviness. The alfalfa on top is crunchy surprise in sprightly cooling green. Agedashi Tofu. Jesus Christ. 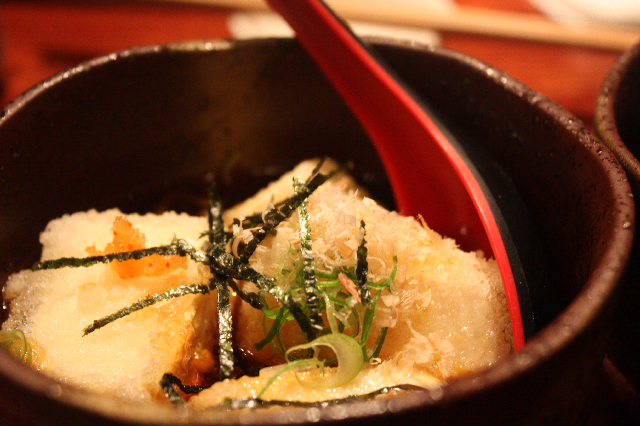 Agedashi tofu makes me completely understand the existence of the Sumo 'physique' in Japanese culture. It's like an alimentary Ode to All Things Japanese. I have been loving this dish in all of its many incarnations over the years. This was killer age. Gentle cubes of silken tofu with a mesmerizing whisper of almost viscous batter - not so much clinging to the tofu and ephemerally lingering about it, strips of seaweed and flaked bonito, bathing in a groan worthy broth, courageously confused by a tangle of traumatically tantalizing soba. Like a swathe of flavours and textures. Solid and Brothy. Soft and Slippery against Chewy and Dry. Elements. Serpentine and angelic. It's like a little universe in a heavy bowl, salty and sweet and kaleidoscopic. 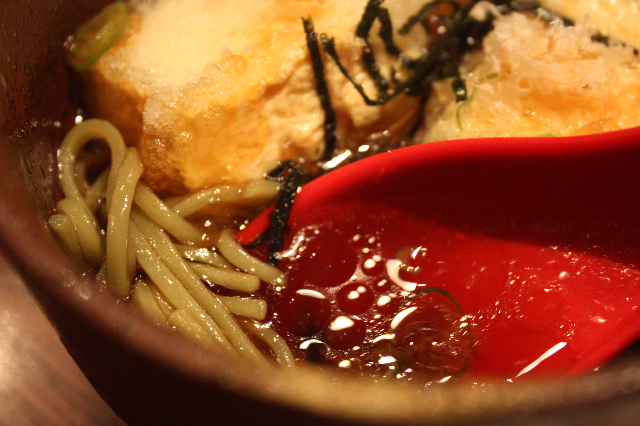 Slurp and sip and dip in the spoon, watch creamy tofu fall away from itself and into coils of glistening soba and broth. Swirling and smiling at you from the bowl - one sip and you di. You feel the spoon and its treasure touch your lips and then there's the fall...it writhes slowly, in warm spirals down your throat and into your being. It slips from soup to liquid Rilke, it transforms every fluid inside you into a strong reality, which would rise and circulate, in equilibrium, blindly. 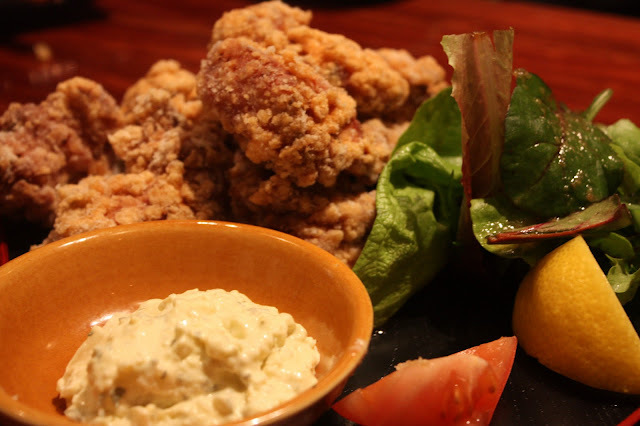 ...courtesy of My fowl munching friends, the Karage chicken with tartare, as something carnivorously crunchy and worthy of mention. I did dip bits of vegetable, again and again, into the thick creamy tartare to best approximate the experience. Absolutely swoon worthy, as was the smartly dressed salad that held the chicken's hand. 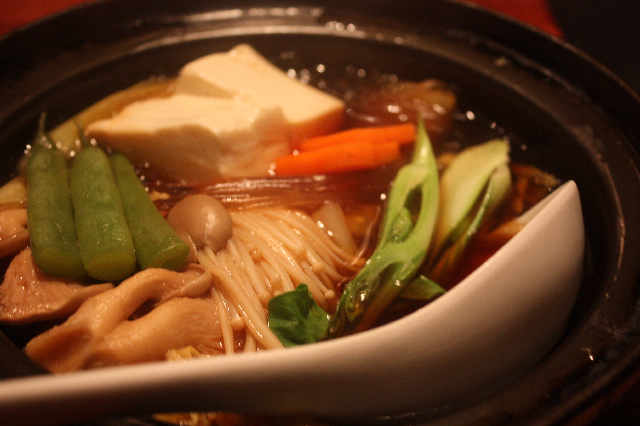 Or, perhaps some slow cooked vegetable sukiyaki. It's like Hot Pot JR Cash. Cool, deep, heady with flavour and real, all the way through. Slippery bundles of beautiful mushroom drift alongside cabbage and leek and elegant tofu, with lashings of glass noodle slithering through - in a crowded sea of yummy. This is delicious, slightly sweet and light and beautiful. 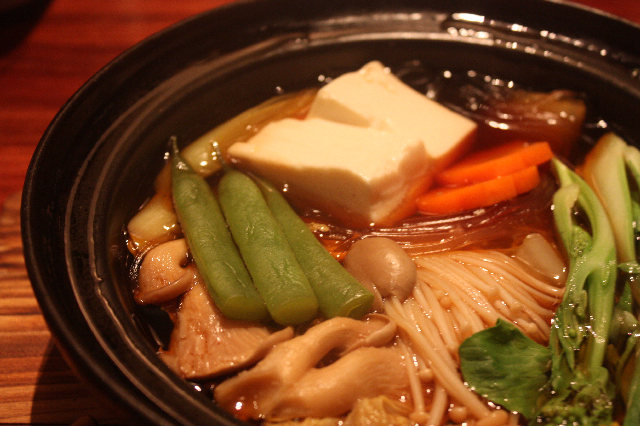 The texture and shapes of the vegetables play off wonderfully against the mushroom and noodles. It's a down right ring of fire. 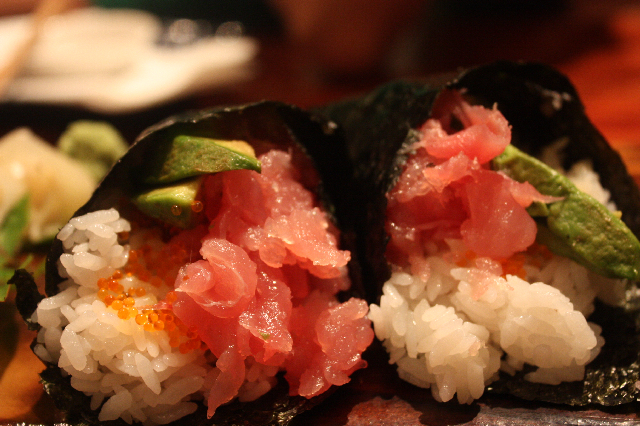 Sushi hand rolls were luscious and overflowing with glowing in scarlet tuna flesh. Sashimi platters came out arranged like a tray of oceanic jewels. The presentation is precious and careful and startling. Some of the sashimi platters had little fish arranged as though they had suddenly darted, right from sea to plate, and become trapped in air, immortalised forever. The arrangements are so beautiful for such a simple place. They tower upwards and lie upon beds of tightly packed ice. Edible origami. 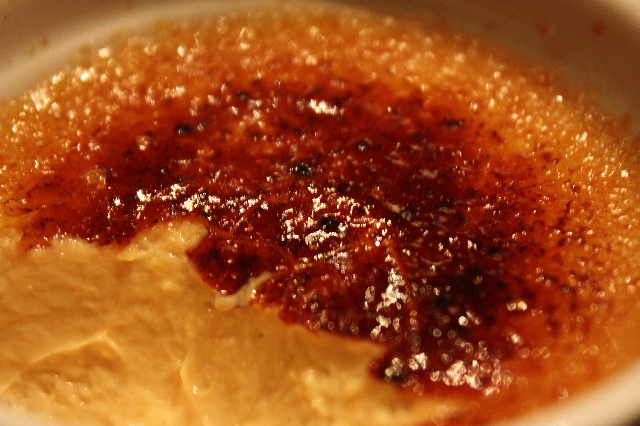 Round it all off with a subtle Kokutou brulee, incandescent with Japanese brown sugar and potted, burnt creaminess or a saucy pudding of beguiling chocolate. Slowly sip a good green tea to let the night linger on just a little longer. Easy does it, and iiza does it, too. With beautiful sake and beer on offer, you don't even need any company. Just talk to the dumplings and the soup. This is Newtown dining out, and all grown up! Iiza Jappens at a: 184 King St, Newtown. Phone ahead for bookings on (02) 8095 9260 - it gets busy most nights of the week. You can also book online @ info@iiza.com.au, with a full menu available at http://www.iiza.com.au/. That's assuming you old fogeys have a working internet connection and know how to use it. The staff are gentle and attentive and the lunch is as as good as the dinner. Iiza, Newtown. It's a (totally legal) whale of a time.